The Hazelwood power plant closed operations today. In the lead up to its closure, the plant operated all eight of its Units except for 10 days or so when it ran seven of them. During those 31 days, this plant generated 15% more power than every wind plant in Australia combined. Over the last 15 years or so, those 43 wind plants have been constructed, and have been delivering their power. The total Nameplate of all those wind plants is just on 3900MW, which is around THREE times larger than what Hazelwood averaged over this last Month. (1306MW) The Hazelwood plant originally had a Nameplate of 1600MW, and, as it is now 53 years old, many parts of the process that make up each individual Units operation had now gotten old, and the plant could no longer generate at its maximum, but after 53 years, to actually total out at a maximum generation of 1380MW with all 8 Units running, that total is still 86% of its original capability, and averaging 1306MW over these last 31 days, that’s a Capacity Factor of just under 95% of the current total power generation. So, here we have wind power with the most current and latest technology not even managing to generate the same power as an aging ancient power plant which has been superseded by four (and soon to be five) levels of coal fired power generation technology. I have not cherry picked any data here, as it was a direct comparison for the same 31 days for both Hazelwood and also for wind power. This same period showed that wind power operated at close to its yearly Capacity Factor for power generation, and that yearly average is 30%, and for these last 31 days, wind power had a Capacity factor of 29%, almost right on that yearly average, so it was not a case of selecting days when wind power operated poorly, as on some days during the Month, wind power did generate more power than Hazelwood did. Australia has spent literally billions of dollars on the construction of these 43 wind plants and they cannot even equal, let alone actually compete with a power plant from the Nineteen Sixties. Hazelwood had eight Units. Those 43 wind plants have around 2400 turbines on poles spread out across four States of Australia, and yet an ancient power plant generated and delivered more power than all of those 2400 wind turbines combined. If wind power cannot equal the power generation of one ancient coal fired power plant, then there is absolutely no way wind power can replace coal fired power. A media release yesterday said that the operators would begin closing the plant, one Unit at a time in a week long process, starting this Friday, 24th March. That media release is shown at this link in an article from Australia’s Financial Review. As each Unit closes, I will be taking screen images similar to the second image below of the power plant’s output, and at the same time, also taking screen images of the wholesale cost for electricity in Victoria, showing the same time as the Unit closes, and from both images, you can see how the price for electricity will spike, as the cheapest power in the State is no longer available. At the same time as that first Unit begins to close, then that will be the last entry for data collection for Hazelwood, all the wind plants in Australia, and the wind plants in the State of Victoria, the same State where this Hazelwood plant is located. As a matter of interest, I will keep doing the daily power output calculations to show you how long it takes for Australian wind power to catch up to what was delivered from Hazelwood during this last recording process. I mentioned in the main body of text for this Post that I noticed this on the 2nd March, how Hazelwood was running all eight Units. I was curious as to how long this had been happening, so, using the same SCADA data tables I mention in the text, and the same data for Wind Power, I went back to see how long Hazelwood had been running those eight Units to see if the actual comparison could begin at the date when a decision was made to run as many Units as possible. I noticed that on Sunday 26th February, Hazelwood was only operating 6 Units. Early on Monday morning 27th February, the seventh Unit ran up and began delivering its power. Then, early on Tuesday morning, 28th February, the eighth Unit ran up and started to deliver its power as well. That continued on Wednesday 1st March, and then I noticed it on the next day, Thursday 2nd March. So the start date for this record keeping can effectively begin on that Monday 27th February. Rather than do the whole process over, I’ll just state the figures for those three days, and then add the new running total in at the end of the data recording totals at the end of Wednesday 22nd March below, highlighted with a direction back to this text here. Those totals are as follows, and they are repeated below. Tuesday 28th February – Hazelwood – Eight Units operational – 1320MW. Wind Australia – 900MW. Wind Victoria 280MW. 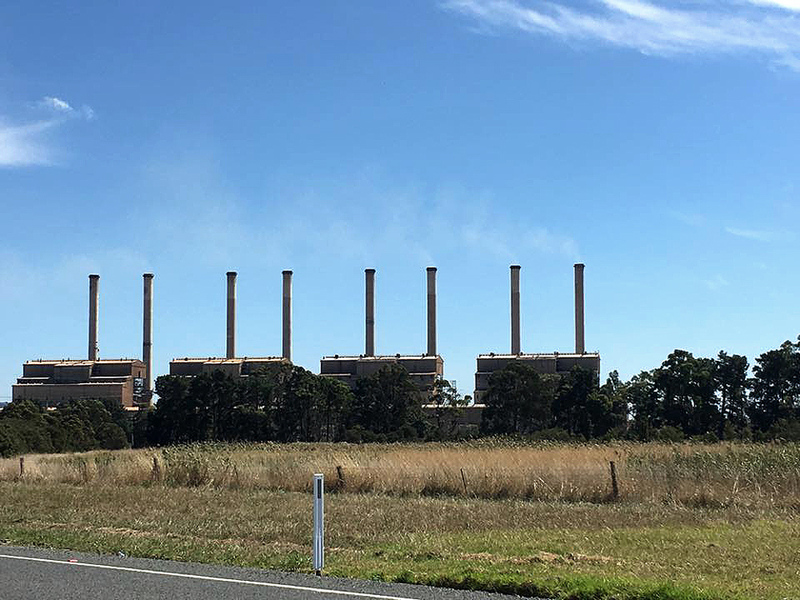 Wednesday 1st March – Hazelwood – Eight Units operational – 1380MW. Wind Australia – 780MW. Wind Victoria – 240MW. This day looks likely to be the last day that the Hazelwood Power Plant operated with all eight Units generating power. At around 3.45PM, Unit 8 reduced its generation. This is the Unit that has already been offline once before this Month for a week, and a couple of times has reduced its output. This time the reduction was more marked, from around it’s 170+MW down to between 128 and 134MW, and it stayed at around that level for the rest of the day. Then, at around 11.05PM, the output power started to fall off even more, leading me to believe that it was undergoing shutdown. Over the next two and a half hours it wound right back to around 25MW. For Hazelwood, it looks increasingly like this day signifies the beginning of the end for this old warrior, supplying stable amounts of power into the Victorian power grid for 53 years. At 1.51AM on Monday 27th March 2017, Unit 8 shut down, the first of Hazelwood’s Units to begin the shutdown process. At 8.10 on this Monday morning, Unit 6 also started the shutdown procedure. It took two hours, and at 10.10AM, it also was back to zero, so now there are two Units shut down. The third Unit, Number 4 started to shut down at 2.25PM, and was back to zero at 3.10PM, so three Units have shut down today, with three Units closing tomorrow and the last two Units on Wednesday. The main image below this block of text shows the power delivery at 3.35PM on Sunday, the last time all eight Units were fully operational at Hazelwood, and delivering the maximum power they were capable of delivering at the time, and that was 1325MW. The Hazelwood Units are indicated as HWPS numbers one to eight. This image below shows what happened to the cost of wholesale power in Victoria as Unit 8 closed, beginning at 11PM on the Sunday night. The cost for power is indicated by the dark blue line, and the arrow pointing to that cost partially covers the rise, but you can see that it has risen. The time is highlighted at the bottom of the graph in dark grey. If you press on the image, it will open in a new and larger window. This second image shows what happened to the cost of wholesale power when Unit 6 shut down at 10AM, and again, the cost is the dark blue line. Note that the price spike was higher and then settled back to to a new cost, higher than it was immediately prior to the shutdown. The time is highlighted at the bottom of the graph in dark grey. Again, if you press on the image, it will open in a new and larger window. Unit 2 started its shut down at 10PM on the Monday night, and by 11.10PM, it too was back at zero generation. Then, at around 7.30AM on the Tuesday morning, Unit 7 started to go off line, finally going back to zero at 9.35AM. That was followed at 2.25PM when Unit 4 started its shutdown procedure, also going back to zero at 3.10PM. This left just Unit 1 and Unit 3, generating a total of 320MW for the remainder of the day. It was a below average day for wind power generation also, and for two periods of two hours each time, those two Units at Hazelwood were generating more than the combined total of all the 15 wind plants with a Nameplate of 1485MW in the same State of Victoria. Hazelwood’s last day of power generation. At 9.10AM, Unit 3 started its shutdown procedure and was back at zero at 10.45AM, leaving just Unit 1 on line. This Unit 1 fluctuated a couple of times, giving the impression it was shutting down, but it settled back to around 160MW or so, until 3.30PM, when the shutdown procedure began, and at some time between 4.00PM and 4.06PM, Unit 1 reached zero, and that was the end for Hazelwood. The image below shows Unit 1 delivering it’s last power before going back to zero. It is indicated as HWPS1, and shows the power generation total at 72MW. The next data profile, at 4.06PM showed Hazelwood with all Units at zero. This is the Original text for this Post below. The Hazelwood Power plant in the State of Victoria in Australia is scheduled for closure on the 31st March 2017. The Image below is Hazelwood Power Station and was taken on the 8th March 2017, during this same Month of the plant’s closure. Hazelwood Power Plant – 8th March 2017. Image Credit David Maddison. If you click on the image it will open in a new and larger window. You can just make out the fine wisps of smoke coming from the eight stacks. This Post will detail the power delivery data with respect to the closure of the Hazelwood Brown Coal Fired Power Plant in Victoria. I noticed recently that in the lead up to the closure of this plant, the plant’s operator ENGIE, is running all eight units constantly to get all they can out of it before it is scheduled for closure. The plant opened in 1964, and is now 53 years old. At opening, the eight units each had a 200MW generator, for a total Nameplate of 1600MW. As the plant is now so old, those old generators cannot make their original maximum power, but even now they are still managing to deliver a total Nameplate of between 1374 and 1380MW, which is still around 86% of its original rated maximum power, which is not bad for generators that are now 53 years old. For the sake of comparison, a major study of nearly 3,000 on-shore British wind farms found that the turbines have a very short operating life, and the findings said that they had a lifetime of only 12 to 15 years, and not the 20 to 25 year lifespans applied in politicized government and industry projections. The report also concluded that a typical wind turbine generated more than twice as much electricity during its first year than upon reaching 15 years of use. Performance deterioration for off shore installations is even far worse. So that 14% reduction in power output after 53 years operation of Hazelwood stands up well when compared to wind power turbine longevity and generation ability. In this screen image below of the power delivery, it shows all eight units, designated HWPS and numbered 1 through 8. This image is taken from the market operator, the AEMO site showing data for power delivery from every power plant in Australia East of the Western Australian border, and here, I have just isolated the area specific to this Hazelwood power plant. From this image, note the date in the title of the document at the top of the image, 201703081055, which indicates the Year, 2017, the Month, 03, March, the date 08, 8th March, and the time 1055, hence 10.55AM on Wednesday 8th March 2017. The data is updated every four minutes, so this screen image is just for that one point in time, incidentally, around the same time as the image of the power plant was taken. The Plant in question is Hazelwood, here indicated as HWPS, and the numbers in the next column to the right indicate the power output of each individual Generating unit, so for an explanation of that power output, look at the entry for HWPS7, and where it says 183 alongside that, and that indicates that this unit is currently delivering 183MW of power. Now, as you can see here, the outputs range from 162 to 183MW, so none of those units is delivering it’s original maximum rated power of 200MW, but to be delivering even this much after 53 years is astonishing really, and the fact that they can still be running all eight units is also astonishing as well. The total power delivery for this image is 1373MW, and that total varies very little from that, perhaps with some units delivering an extra MW so that sometimes the total can be as high as 1380MW. For verification of what I have above, I have used the information from the Australian Energy Regulator, the AEMO from their NEMWEB site shown at this link. It lists every power plant in Australia and gives their current output power. It’s updated every four to six minutes. Once at the link, scroll right to the bottom for the latest time link. Click on that link and a text box will open asking you to save the link, a Zip File, usually to the default of the Downloads folio on your computer. Once saved, then click on that file in your Downloads folio, and it will ask you to open the file in a spreadsheet format, and the one I use is Excel. That file will then open up in the spreadsheet, and you can look at any power plant you wish. What I will indicate with the following is the total actual power delivered into the Victorian grid by Hazelwood, and for the sake of comparison, the total power delivery from every Wind Plant in that same area for Australia, and also the total power delivered from just the Wind Plants in that same State of Victoria. This wind data is taken from this site, where it details the output from all Australian wind plants, and this can then also be isolated down to just the wind plants in Victoria. The information is current to the current time, and you can change the date by using the ‘button’ at the top right of the screen which indicates the date. I have used the wind data for each date shown below, and while the output varies across the hours in the day, I have averaged it across the 24 hours to give an average output. In the case of the Hazelwood plant, as that output varies ever so slightly, I will use an average of 1377MW for the total power from Hazelwood. Hazelwood Power delivery with all eight units operational – 33.05GWH, at an average of 1377MW per hour for 24 hours. All Australian Wind Power – 24GWH, at an average of 1000MW per hour for 24 hours. All Victorian Wind Power – 9.6GWH, at an average of 400MW per hour for 24 hours. For wind power, this was a day slightly below average, The average Capacity Factor (CF) for wind power in Australia is around 30%, and this day the CF for wind in Australia was around 25%, and for Victoria, it was around 27%. As you can see, the output from every wind plant in Australia was only the same as delivered from 6 of Hazelwood’s eight units, and for Victoria, the total for wind is just more than from two of Hazelwood’s eight units. At the end of this first day of record keeping, Hazelwood has delivered 18% more power than every Wind Plant in Australia. This was a good day for wind power with the all Australian wind CF at 38.5% and for Victoria, 33.3%. Running total averages for Hazelwood 1377MW, Wind Australia 1250MW and Wind Victoria 263MW. The running CF for wind are Australia 32% and Victoria 30%. At the end of this second day of record keeping, Hazelwood has delivered 10% more power than every Wind Plant in Australia. A below average day for all wind power Australia, with a CF of 25% and for Victoria, a day well below average with a CF of 15%. At the end of this third day of record keeping, Hazelwood has delivered 15.3% more power than every Wind Plant in Australia. An average day for all wind power Australia, with a CF of 30% and for Victoria, an average day with a CF of 30%. At the end of this fourth day of record keeping, Hazelwood has delivered 15.6% more power than every Wind Plant in Australia. An above average day for all wind power Australia, with a CF of 37.2% and for Victoria, a day well above average with a CF of 40%. At the end of this fifth day of record keeping, Hazelwood has delivered 11.4% more power than every Wind Plant in Australia. An above average day for all wind power Australia, with a CF of 37.2% and for Victoria, an average day with a CF of 30%. At the end of this sixth day of record keeping, Hazelwood has delivered 10% more power than every Wind Plant in Australia. A below average day for all wind power Australia, with a CF of 25.6%, and for Victoria, a day well below average with a CF of only 20%. At the end of this seventh day of record keeping, Hazelwood has delivered 12.4% more power than every Wind Plant in Australia. At the end of this eighth day of record keeping, Hazelwood has delivered 14.2% more power than every Wind Plant in Australia. At 9PM on this Friday night, Unit Number 2 at Hazelwood dropped off line, so for this day, the total power delivery drops, which in turn, drops the Overall total power delivery from Hazelwood marginally, as shown in the changed statistical data for the Hazelwood Plant, so that’s 21 hours at 1377MW, and 3 hours at 1197MW for an average 24 hour total of 1355MW, and this also marginally changes the running average for Hazelwood from 1377MW down to 1375MW. This day also saw a marked drop in Wind Power delivery, both for the whole of Australia, and also for Victoria, also reflected in the changed averages for both sets of Wind power data. Hazelwood Power delivery with all eight units operational until 9PM, and 7 units operational for the remaining three hours – 32.52GWH, at an average of 1355MW per hour for 24 hours. A day of very low wind power delivery for all Australia, with a CF of only 14.1%, and for Victoria, an extremely low wind power delivery, with a CF of only 8%. At the end of this ninth day of record keeping, even though Hazelwood lost one of its units, it has still delivered 19.2% more power than every Wind Plant in Australia across the last nine days. For all of this day, that Number 2 Unit was off line, leading me to believe that as the plant closes at the end of the Month, then there is no need to repair a Unit that fails, so that might be it for Unit 2, hence Hazelwood is now running on only seven Units. Even so, it still delivered more power from those seven Units than all the wind plants across Australia on this day. Of note here when compared just to wind power delivery in Victoria, after ten days, just two of Hazelwood’s eight Units have delivered more power than all the wind power in Victoria for the same ten days. Hazelwood Power delivery with seven units operational – 28.32GWH, at an average of 1180MW per hour for 24 hours. A day of below average wind power delivery for all Australia, with a CF of only 28.7%, and for Victoria, another extremely low wind power delivery day, with a CF of only 10.7%. At the end of this tenth day of record keeping, even though Hazelwood is now running only seven of its eight Units, it has still delivered 18% more power than every Wind Plant in Australia across these last ten days. At some time between 7PM and 8PM this Sunday night, Unit Number 8 dropped out of commission at the Hazelwood plant. At the same time that was happening, the previously out of commission Unit Number 2 started back up again, so the situation was that Hazelwwod still had 7 of its units operational. The Unit which dropped out was generating less power, than the Unit which came back on line, so the total power delivery actually rose marginally from 1180MW to 1190MW. Even so, I will keep power output for this day at the lower level of 1180MW, and raise it back to 1190MW tomorrow, if nothing more changes. The Australian total for wind power had a good day and their total power delivery for this day was an average of 1500MW, higher on this day than for Hazelwood, hence the running totals change, and the percentage also changes a little as well. A day of above average wind power delivery for all Australia, with a CF of 38.5%, and for Victoria, another day of low wind power delivery, with a CF of 20%. At the end of this eleventh day of record keeping, even though Hazelwood still has only seven of its eight Units operational, it has still delivered 14.4% more power than every Wind Plant in Australia across these last eleven days. During this Monday evening, a couple of the Units at Hazelwood fluctuated in their power delivery, but that was only for short periods of time, and in fact should be a testament to the people actually running the plant, trying to keep what is basically an ancient old clunker delivering power from generators that are now 53 years old. The seven Units which are operational had a combined total power delivery of 1190MW for most of the day, and at a couple of times during the day that was actually as high as 1198MW, but with those minor fluctuations, the average was down to 1185MW. Hazelwood Power delivery with seven units operational – 28.44GWH, at an average of 1185MW per hour for 24 hours. It was a slightly below average day for wind power across the whole of Australia with a CF of 26.9%, and for Victoria another day of below average power delivery with a CF of 23.3%. At the end of this twelfth day of record keeping, even though Hazelwood still has only seven of its eight Units operational, it has still delivered 14.2% more power than every Wind Plant in Australia across these last twelve days. What is interesting here is the total power delivered for consumption, and for Hazelwood that is 382GWH, while for all the wind plants, it is 328GWH, so Hazelwood has delivered 54GWH more power than every wind plant, and while that total may seem obscure, that’s enough power to run 257,000 homes for those 12 days. From a 53 year old power plant. The seven units at Hazelwood operated throughout the day and night at between 1188MW and 1198MW, in fact most of the time, pretty stable at that upper figure of 1198MW, so I’ll use an average here of 1195MW. Wind had a day of below average power generation across the whole of Australia, also reflected in Victoria as well. Hazelwood Power delivery with seven units operational – 28.68WH, at an average of 1195MW per hour for 24 hours. It was a day of well below average for wind power across the whole of Australia with a CF of 21.8%, and for Victoria another day of well below average power delivery with a CF of 12%. At the end of this thirteenth day of record keeping, even though Hazelwood still has only seven of its eight Units operational, it has still delivered 15.2% more power than every Wind Plant in Australia across these last thirteen days. Over this same time, the total power delivered by every wind plant in Victoria has been delivered by just two Units at Hazelwood. Those seven Units at Hazelwood just hummed along all day at the stable total of 1195MW. This was a day of high wind power generation for both the whole of Australia, and also for Victoria, in fact one of the best days for power generation in recent times. Even so, Hazelwood has still generated more power than all those wind plants over this now two week recording period. Hazelwood Power delivery with seven units operational – 28.68GWH, at an average of 1195MW per hour for 24 hours. It was a day of well above average wind power generation across the whole of Australia with a CF of 44.8%, and for Victoria also a day of well above average power delivery with a CF of 43.3%. At the end of this fourteenth day of record keeping, even though Hazelwood still has only seven of its eight Units operational, it has still delivered 11.2% more power than every Wind Plant in Australia across these last fourteen days, even after a high wind power generation day. Those seven Units at Hazelwood again just hummed along all day, perhaps a little down on overall power, albeit only fractionally, hence the average was down a little to 1192MW. This was again a day of quite high wind power generation for both the whole of Australia, and also for Victoria. Now consider this for a minute. At 3.30AM, nearly everyone is tucked up tightly in bed, asleep. At that time however, the State of Victoria is consuming its least amount of power for the day, any day, and every day, and even at that time, the total power being consumed is (around an average of) 4000MW, and at 3AM on this Thursday morning, Victoria was consuming 4236MW of power. Hazelwood, with its seven Units running supplied 1192MW of that power and that’s 28% of the State’s consumption, at 3.30AM, while you all slept. Hazelwood Power delivery with seven units operational – 28.6GWH, at an average of 1192MW per hour for 24 hours. Again, it was a day of well above average wind power generation across the whole of Australia with a CF of 43.6%, and for Victoria also a day of well above average power delivery with a CF of 43.3%. At the end of this fifteenth day of record keeping, even though Hazelwood still has only seven of its eight Units operational, it has still delivered 9.2% more power than every Wind Plant in Australia across these last fifteen days, even after two consecutive days of very high wind power generation. At Midnight tonight, Hazelwood was generating 1200MW, and spent most of the day hovering around 1195MW. It was another day of high power delivery from wind power, for the third consecutive day, but think about this in reference to wind power. The Average Capacity Factor for wind power is 30%, and while that is translated to delivering 30% of its full rated power across a full 24 hour day, it can also be expressed as delivering its full power for 30% of that same 24 hour day, so 7.2 hours, and at least seven units at Hazelwood have been running full time, 24 hours a day for these last 16 days. Large scale wind plants started being constructed around the year 2000, so in 17 years, those 43 Wind Plants with around 2,400 of those wind towers with turbines on top are still not able to deliver the same power as one ancient coal fired plant, so the idea of wind power replacing coal fired power is disproved by that one fact alone. Again, it was a day of slightly above average wind power generation across the whole of Australia with a CF of 42.3%, and for Victoria also a day of well below average power delivery with a CF of 40%. At the end of this sixteenth day of record keeping, even though Hazelwood still has only seven of its eight Units operational, it has still delivered 5.4% more power than every Wind Plant in Australia across these last sixteen days, even after three consecutive days of very high wind power generation. Seven days ago, when Unit 8 went offline, I suspected that might be the last we saw of that Unit, because with the plant scheduled to close at the end of the Month, there was no real reason to fix any problem, and with so many processes in the chain of power generation, that fault need not be remedied with closure imminent. However, at 8AM this Saturday morning, Unit 8 started to run up again, and after four hours, it reached its full power delivery at Midday, and all eight units delivered their power for the remainder of the day. I suspect, by nature of a hunch, that the people working at the plant want to show that even after 53 years, they can still operate all of their Units right up to the closing down day in an act of defiance to prove the naysayers wrong that this ancient plant cannot do what it once could. It’s astonishing to think that 53 year old generators can run 24 hours a day for what had been seventeen days now. Hence the output total for Hazelwood changed slightly. Hazelwood Power delivery with eight units operational – 31.32GWH, at an average of 1305MW per hour for 24 hours. Again, it was a day of slightly above average wind power generation across the whole of Australia with a CF of 32%, and for Victoria also a day of well below average power delivery with a CF of 17.3%. At the end of this seventeenth day of record keeping, with Hazelwood now back to operating all eight of its Units, it has still delivered 5.3% more power than every Wind Plant in Australia across these last seventeen days. Hazelwood’s output hovered between 1350MW and 1370MW all day on a day when wind power was down, hence the rise in total percentage difference between Hazelwood and all the wind plants in Australia. Incidentally, Hazelwood had an original Nameplate of 1600MW, and now, after 53 years, that has dropped to around 1380MW. The total Nameplate for all Wind power in the same State, Victoria is 1485MW, just less than Hazelwood’s original total when new, and more than what the total is now after those 53 years. However, over these last almost three weeks now, Hazelwood is delivering 3.5 times the power of all those wind plants in Victoria, barely managing the same output as just two of Hazelwood’s eight Units. The news today mentioned that the operators ENGIE would be doing a staged closure starting on the 27th March, with the last boiler going cold on the 2nd April. There seems to be general panic as to what will happen when the plant does close. Hazelwood Power delivery with eight units operational – 32.64GWH, at an average of 1360MW per hour for 24 hours. Again, it was a day of below average wind power generation across the whole of Australia with a CF of 23%, and for Victoria also a day of considerably below average power delivery with a CF of 10.7%. At the end of this eighteenth day of record keeping, with Hazelwood now back to operating all eight of its Units, it has still delivered 7.1% more power than every Wind Plant in Australia across these last eighteen days. Hazelwood’s eight Units just hummed along all day delivering around 1360MW all day, sometimes a little higher and sometimes a little lower. However, what is indicative here is that Hazelwood’s Units deliver the maximum they can get out of these 53 year old generators, and they do that all the time, 24 hours each day for this whole 19 day reporting time so far. On the other hand, note here how wind power has its good days and it also has its bad days, and even as you view the data for each day, I have averaged it here for an average total across the whole 24 hour day, and even during that 24 hour period there are times when wind power delivers at a higher rate, and times it delivers at a lower rate, highlighting the variability of wind power, while at the same time, the power from the coal fired Units is constant. Again, it was a day of well below average wind power generation across the whole of Australia with a CF of 19.2%, and for Victoria also a day of well below average power delivery with a CF of 15.5%. At the end of this nineteenth day of record keeping, with Hazelwood still operating all eight of its Units, it has delivered 9.2% more power than every Wind Plant in Australia across these last nineteen days. The output from Hazelwood averaged between 1365MW and as high as 1380MW today, as the plant enters its last few days of power generation. It was a day when the wind power was around the average, just a little below. It’s astonishing how these Units at Hazelwood, now 53 years old are still capable of running at their maximum, and at least six of the Units have done that constantly for 20 days now, for 24 hours of every day, something that wind power can only dream of doing. Hazelwood Power delivery with eight units operational – 32.88GWH, at an average of 1370MW per hour for 24 hours. Again, it was a day of average wind power generation across the whole of Australia with a CF of 29.4%, and for Victoria also a day average power delivery with a CF of 26.9%. At the end of this twentieth day of record keeping, with Hazelwood still operating all eight of its Units, it has delivered 9.6% more power than every Wind Plant in Australia across these last twenty days. On a day of high to very high wind power generation, Hazelwood again just hummed along with all eight Units running. At times during the day a couple of Units lost a little of their total power delivery, reflected in the slightly lower overall average for the day, but that was only for short periods before again delivering the maximum power they can manage after so long. If all goes to plan, they only have a few days left in them, so it would be nice to see them all still operational when the staged closure begins. Today was a day of way above average wind power generation across the whole of Australia with a CF of 43.6%, and for Victoria, it was a huge day for wind power delivery, one of their best days for power generation in a long time, with a CF of 50.5%. At the end of this twenty first day of record keeping, with Hazelwood still operating all eight of its Units, it has delivered 8% more power than every Wind Plant in Australia across these last twenty one days. Tuesday 28th February – Hazelwood – Eight Units operational – 1320MW. Wind Australia – 950MW. Wind Victoria 280MW. Adjusted running averages for Hazelwood, Wind Australia, and Wind Victoria are now as follows. So now, after 24 days of record keeping , and Hazelwood still operating all eight of its Units, Hazelwood has delivered 10.6% more power than every Wind Plant in Australia across these last 24 days. At around 6AM on this Thursday morning, Unit 8 reduced its power output and stayed around 125MW to 130MW for the rest of the day. Unit 8 was the Unit that was offline for a week, and then came back for a further 7 days at near full power before reducing it this morning. My guess is that rather than take the Unit totally off line, the people running the plant want to keep it operational in some manner up until the time that the shutdown begins. While running with a reduced output, that then lowered the total power delivery from the plant to an average of 1330MW for the full 24 hour period. I suspect that when the time comes for the staged closure, Unit 8 will be the first one removed from service. Hazelwood Power delivery with eight units operational – 31.92GWH, at an average of 1330MW per hour for 24 hours. Today was a day of above average wind power generation across the whole of Australia with a CF of 39%, and for Victoria, it was also a day of well above average wind power delivery, with a CF of 47.1%. At the end of this twenty fifth day of record keeping, with Hazelwood still operating all eight of its Units, it has delivered 9.6% more power than every Wind Plant in Australia across these last twenty five days. Contrary to what was mentioned in a media article on Tuesday, Hazelwood did not start the closure sequence today. At around 5PM Unit 8 which had been generating less power for a day and a half again increased its generation back up to the maximum it is capable of generating. Earlier in the Day, Units 1 and 2 lowered their total generation by around 20MW each. Because of that, a total power calculation was recalculated and came to 1330MW. It is still my guess that the people who are working the Plant are doing all they can to make sure all eight Units are in operation right up till the time the sequential closure begins. It was a poor day for wind power generation and at one stage, those 43 wind plants with around 2400 turbines on towers, and a Nameplate of 3900MW were only generating a little over 300MW, the same as for the two Units which reduced their power during this day. Today was a day of well below average wind power generation across the whole of Australia with a CF of 18.5%, and for Victoria, it was also a day of extremely low average wind power delivery, with a CF of 16.1%. At the end of this twenty sixth day of record keeping, with Hazelwood still operating all eight of its Units, it has delivered 11% more power than every Wind Plant in Australia across these last twenty six days. Another of Hazelwood’s units derated a little today, lowering the overall average generation to 1320MW as all eight Units work hard to stay operational. It was a day of extremely low power generation from wind power, as it fell off dramatically throughout the day. At around 11.30PM, the total power being generated by those 43 wind plants with around 2400 turbines on poles, and with a Nameplate of 3900MW were only generating 150MW, at a Capacity factor of only 3.8%. So, of those 2400 turbines, only 90 of them actually had the blades turning. At the same time, Hazelwood was generating 8.8 times the power of all those wind plants combined. Note here I have just picked that one point in time, to show you that even though wind power across the full day may have some days when it equals the power generation of Hazelwood, there are times during the day when power delivery is way down, highlighting the variability of wind power, while Hazelwood generates its power at a steady rate across the whole day. Hazelwood Power delivery with eight units operational – 31.68GWH, at an average of 1320MW per hour for 24 hours. Today was a day of extremely low average wind power generation across the whole of Australia with a CF of 10.8%, and for Victoria, it was also a day of extremely low average wind power delivery, with a CF of 16.1%. At the end of this twenty seventh day of record keeping, with Hazelwood still operating all eight of its Units, it has delivered 13.2% more power than every Wind Plant in Australia across these last twenty seven days. Today, Sunday 26th March looks likely to be the last day when Hazelwood ran with all eight units generating power. I mentioned on Thursday that Unit 8 might be the first Unit taken out of service, and that looks likely now to be the case. At around 3.45PM, Unit 8 dropped its power generation to between 128MW and 134MW, and operated at that reduced level until around 11.05PM when the power started to fall off even more, giving me the impression that it had finally run its last, and was slowly winding down, which proved to be the case over the next couple of hours, finally falling back to zero and offline at 1.51AM Monday morning. Because of that reduction in power from this one Unit, that lowered the overall average for the day to 1306MW. 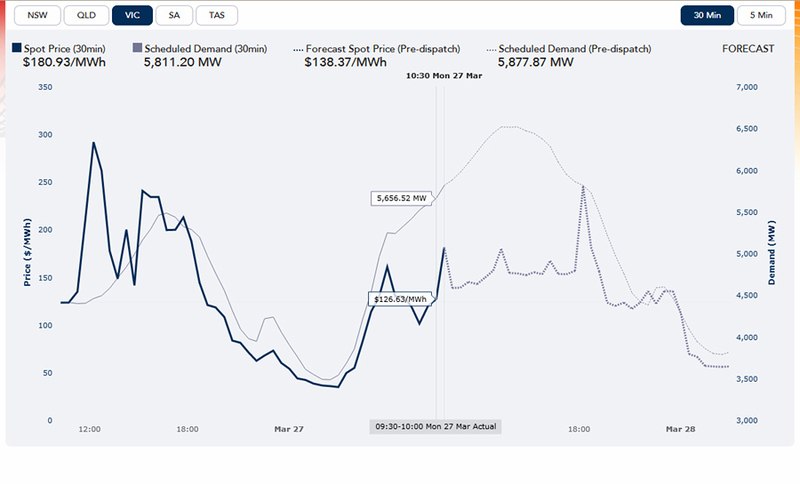 It was a shocking day for wind power right up until 6PM when wind power generation started to rise and continue rising. 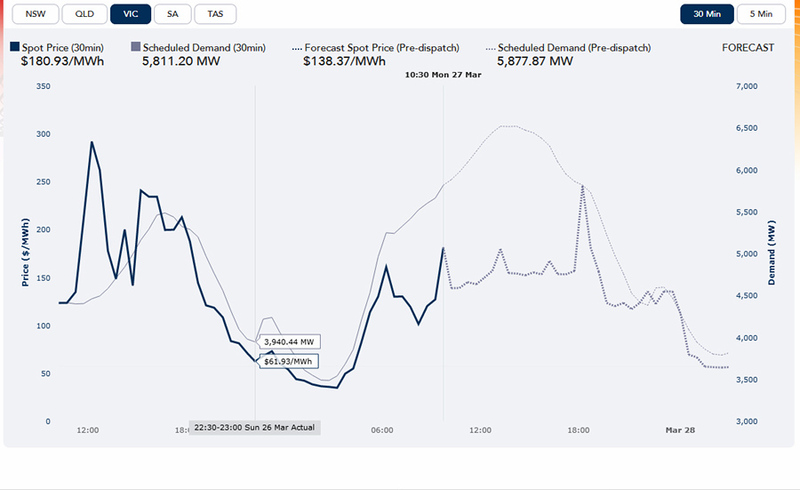 Up until that point, every wind plant in Australia was only generating an average of 300MW, and at times was down as low as 100MW, while in Victoria, where it also rose dramatically at around that 6PM time, it was hovering around 50MW for most of the day, with some times almost at zero. This is now the beginning of the end for Hazelwood, and even though the remaining Units will still be delivering for days to come, as each Unit is brought off line, power generation will fall off dramatically. Hazelwood Power delivery with eight units operational – 31.35GWH, at an average of 1306MW per hour for 24 hours. Today was a day of extremely low average wind power generation across the whole of Australia with a CF of 14.1%, and for Victoria, it was also a day of extremely low average wind power delivery, with a CF of 9.4%. At the end of this twenty eighth day of record keeping, with Hazelwood still operating all eight of its Units, it has delivered 14.8% more power than every Wind Plant in Australia across these last twenty eight days, and it now looks like this might have been the last day Hazelwood operated with all eight Units in service and generating power. This now ends the comparison, as with Units shutting down at the rate of three per day, Hazelwood will be rapidly reducing its power delivery. What I will do is to just indicate the total power delivered by Hazelwood and Wind Australia to show you how long it takes for Wind power to catch up and equal the power delivery from Hazelwood. Total power delivered by Hazelwood Power Plant over these 28 Days is 878.304GWH. Total power delivered by every Wind plant in Australia over these 28 days is 748.608GWH. It was a very good day for wind power generation up until around 3PM, when it dropped dramatically. Hazelwood now has only 5 Units generating power. Total power delivered by Hazelwood Power Plant over these 29 Days is 901GWH. Total power delivered by every Wind plant in Australia over these 29days is 794GWH. Today was a day of below average wind generation, and at the end of this day, only two of Hazelwood’s eight Units were fully operational for the whole day, plus the small amount delivered from the three Units which shut down today, giving a total generation for today from Hazelwood of only 13GWH. Total power delivered by Hazelwood Power Plant over these 30 Days is 913GWH. Total power delivered by every Wind plant in Australia over these 30 days is 811GWH. Today was a day of above average wind generation at 36% Capacity Factor, with a total power delivery of just under 34GWH, and now there will be no more power generation from Hazelwood, other than the tiny 3GWH of power from those last two generators until they ran back to zero today, so Hazelwood’s power delivery will remain at 916GWH from this day forward until wind generation catches up, probably in around three more days. Total power delivered by Hazelwood Power Plant over these 31 Days is 916GWH. Total power delivered by every Wind plant in Australia over these 31 days is 845GWH. Today was a day of slightly above average wind generation at 34% Capacity Factor, with a total power delivery of just under 32GWH. Total power delivered by Hazelwood Power Plant over 31 Days was 916GWH. Total power delivered by every Wind plant in Australia over these 32 days is 877GWH. The last shift ended today at Hazelwood. For wind power, it was a day of very low power generation with an average of only 600MW at a Capacity Factor of 15.4% and a total power generation of 15GWH. Total power delivered by every Wind plant in Australia over these 33 days is 892GWH. Total power delivered by every Wind plant in Australia over these 34 days is 923GWH. Four days ago, the Hazelwood power plant stopped generating meaningful amounts of electrical power. It took four days for the most recent technology wind power to finally catch up to the total power generated by Hazelwood, a technology from the Nineteen Sixties, an ancient relic from the past, still able to generate more power in a Month than every wind plant in Australia combined. Wind cannot replace coal fired power. Hmm! It can’t even equal the power from a 53 year old power plant, now deserted. Amen to that brother. 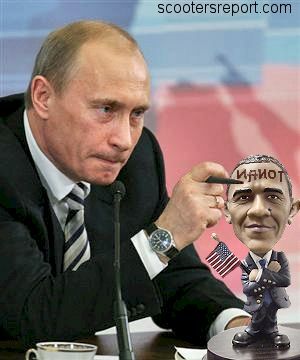 You said it all. Q? When are the wind toys going to be mothballed and replaced with real world electric power plants? i.e. coal, nuclear, hydroelectric, or gas.